The Transform tool allows you to move, rotate, scale and skew a selection or multi-selection. In the Timeline view, go to the frame on which you want to set the first position. In the Timeline toolbar, click the Add Keyframe button or press F6. It is recommended to add a keyframe before moving the character. Moving a character's part without setting a keyframe will create keyframes only on certain parameters of the animation. You could run into issues later on when setting poses between existing ones. Creating a keyframe on all layers and parameters will ensure your pose is set and will not be modified by other poses later on. In the Camera view, select the element to animate and move it. In the Timeline view, go to the frame where you want to set the next position. In the Timeline toolbar, click the Add Keyframe button or press F6. 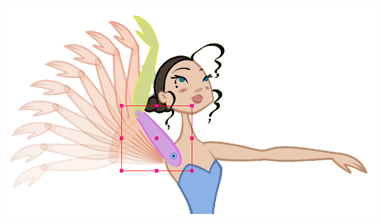 In the Camera view, animate the character.